Lockers of all shapes, sizes, and materials are used in many different applications, ranging from industrial to commercial to residential. 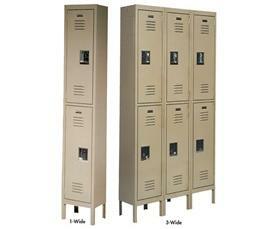 From warehouses to schools to businesses, lockers are found virtually everywhere. The type of locker, however, along with the dimensions, the accessories, the compartments, and other aspects, can all differ. Metal storage lockers and wire mesh storage lockers are two of the different types of lockers that we have an extensive history of dealing with. With our knowledge and background, we are able to help the customer determine the right locker for their needs and help them accomplish their storage goals. In providing both steel and wire mesh lockers for our customers, we have developed many relationships with some of the top manufacturers in the industry, including Lyon and SpaceGuard Products. If you are in need of or would like more information on any of our lockers, please contact us and one of our team members will be happy to assist you. For more information about Lockers or any other product or service from S.W. Betz, fill out and submit the form to the right.